On March 20, 2004, NASA's Mars Exploration Rover Opportunity used a wheel to dig a trench revealing subsurface material beside the lander hardware that carried the rover to the surface of Mars 55 Martian days, or sols, earlier. This scene is an approximate true color rendering combining images from Opportunity's navigation camera (Navcam) and panoramic camera (Pancam). The trench was dug to explore the nature of small wind ripples near the center of Eagle Crater, close to the Opportunity lander. The trench cross-cuts the rover's first "footprint" wheel tracks. The white material at the top is the fabric ramp that the rover drove down to leave the lander. The soil at the end of the ramp was compressed and disturbed by the weight of the rover as it drove down the ramp. 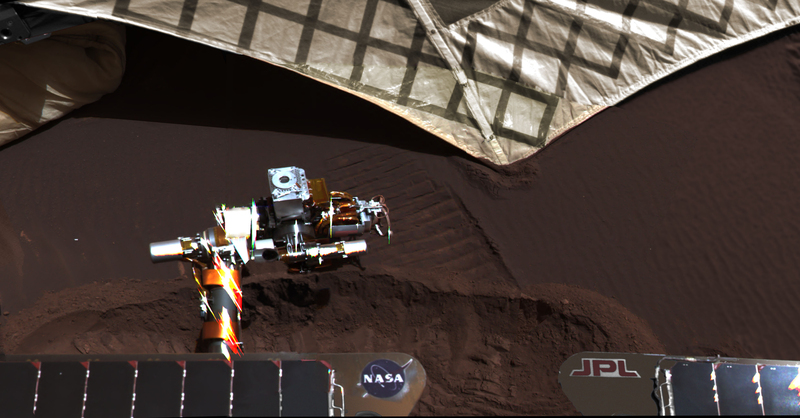 The robotic arm instruments, glistening in the Martian sunlight, were subsequently used to make measurements inside the trench. A Pancam view back into Eagle Crater from the crater's edge, at http://photojournal.jpl.nasa.gov/catalog/PIA05636, shows where this trench was dug beside the lander platform.